It’s no secret that packaging contributes a lot of shelf appeal by telling a product’s story. In the case of Wada Farms’ Simply Perfect russet potatoes, that story has gotten a lot more interesting thanks to the packaging itself, sustainable bags that are made in part from potato starch. Proudly displaying the Tater Made brand, the film bags bring a new sustainability angle to the produce aisle. Local starch. Wada’s brother, Chris, was introduced to Tater Made technology when he was marketing director for the family’s 30,000-acre farm and packing business. Since then, he has signed on to conduct market development for BiologiQ, the manufacturer of the bags’ eco-starch resin, or ESR. Up to 25 percent of Tater Made’s resin is plant starch recovered from local potato processing lines. In 2011, BiologiQ founder Brad LaPray rented space from Wada Farms. His interest in plant starch resins aligned with the Wadas’ innovative bent and coincided with growing pressure from Wal-Mart, a big Wada Farms customer, for sustainable packaging. A potato bag was born. 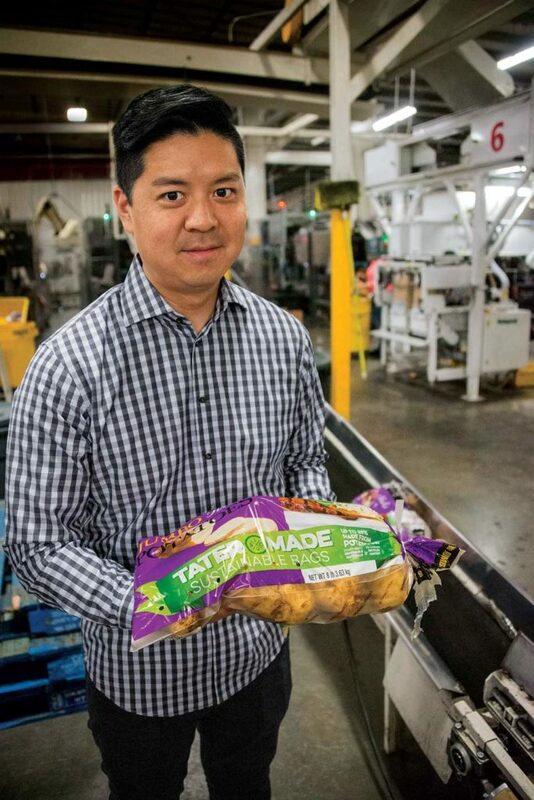 Chris Wada says Tater Made bags provide farmers and retailers a tangible way to demonstrate their sustainability ethics. Replacing one-quarter of a bag’s ingredients with renewable materials is a score in the sustainability column. So is the fact that the bags require up to 50 percent less fossil fuels to manufacture than conventional poly-bags. Or knowing that ESR breaks down in compost piles. And though Chris Wada quickly notes that most produce bags in America aren’t recycled, the strong, thin film bags reduce the volume of material destined to pile up in the nation’s landfills. That leads to careful wording under the strict federal guidelines governing the use of sustainability terms. New version. The original Tater Made bags have been on the market for about three years. 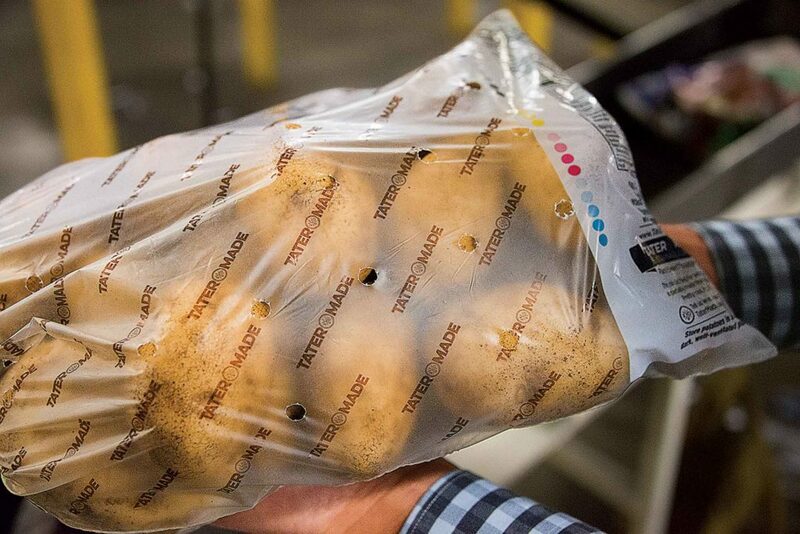 A new version, which allows BiologiQ to co-extrude clear ESR film, allows consumers to see the bags’ contents — a vital feature for many produce buyers. At 1.0 mil, the new film is also 20 percent thinner than the original Tater Made bags, helping BiologiQ amplify its sustainability claims and minimize price. This translucent Tater Made bag is being replaced by a transparent one. Currently, Tater Made bag prices range from equal to poly-bag film to about a 20-percent premium. “It’s all about volume,” Chris Wada says, adding that further adoption will keep pushing prices down. It doesn’t help that petroleum-based plastic prices are low, he acknowledges. Any switch on a packaging line demands attention and a lot of fine tuning. But Bryan Wada still believes in the move to Tater Made bags.